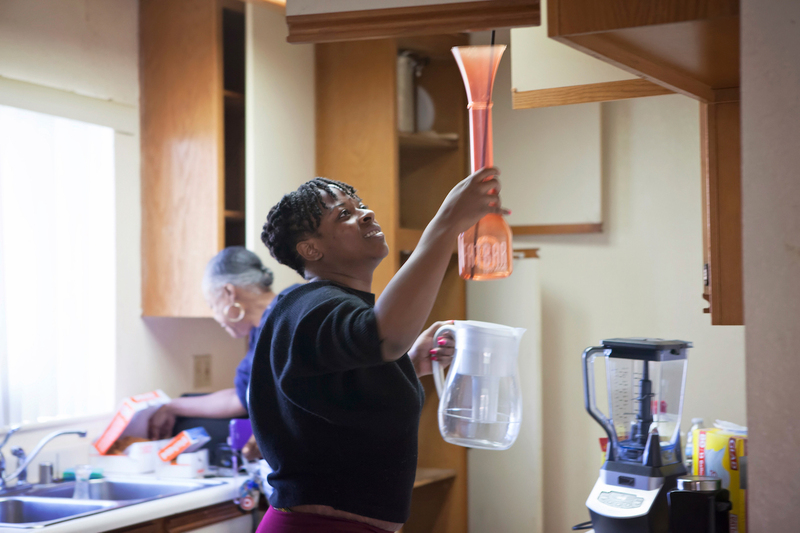 Amber Calloway’s housing problems started on a Tuesday night last December. She remembers the day well because it hadn’t rained that hard in years. That was when everything started to fall apart. 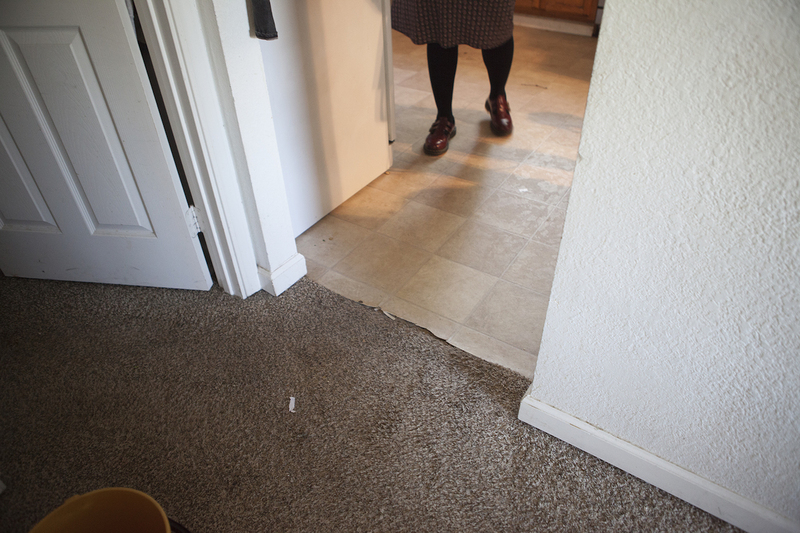 She noticed the carpet was wet in one of the rooms in the three-bedroom house she rents in Meadowview, a diverse working-class neighborhood in south Sacramento. The carpet in the sunroom was also drenched. Amber, her 9-year-old son and fiance had lived in the house for five years. This wasn’t the first time they’d had major maintenance problems. 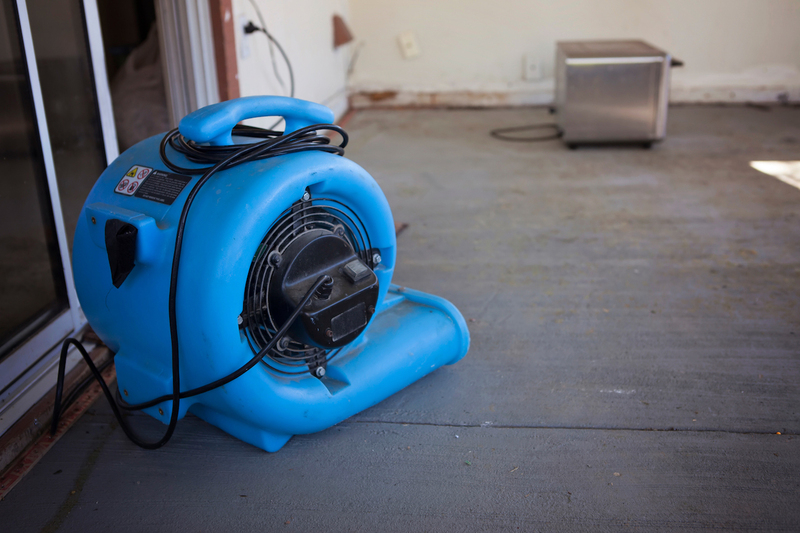 A year earlier, water from a broken pipe in the bathroom leaked into two bedrooms. This time, a contractor said the problem stemmed from a bad foundation and the slope of the house. Amber called her property management company. She asked the property management company if they had other homes available to rent, but there were no vacancies. Three days later, Amber found a termination of tenancy notice in her mailbox. Attached to it, a handwritten note said the owner wanted to sell or renovate the home. She had 60 days to get out. Without a lease, property owners in Sacramento are allowed to raise rents or evict tenants at any time without cause, if they give enough notice. Amber had every reason to be scared. She supports her family on her income as a Medi-Cal claims auditor. Her rent is $1,175. 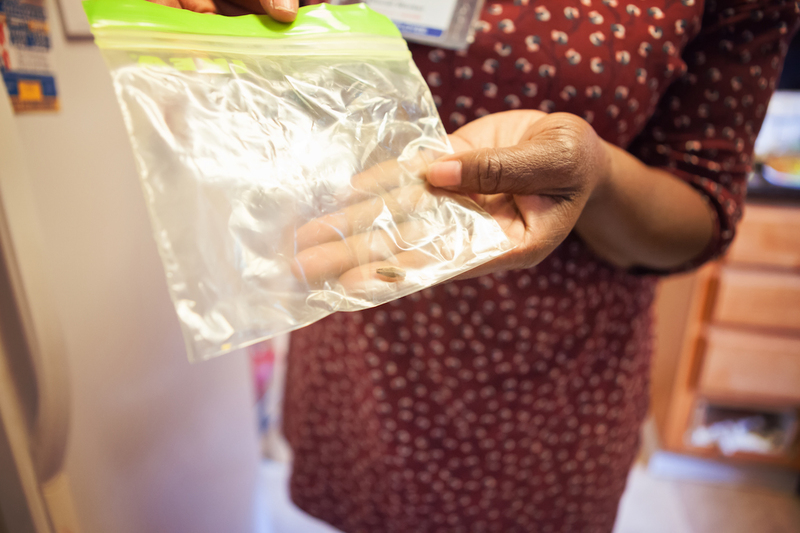 With utilities, it comes to a little more than 30 percent of her monthly income. Housing experts define anyone who pays over 30 percent of their income for housing as rent overburdened. Amber knew she would have trouble finding something she could afford. Rents in Sacramento rose 11 percent in 2016, the fastest in the nation. They’ve increased by 7 percent so far this year. Amber says she doesn’t have the best credit, but says she’s never been evicted. She called the property management company again. The owner of her home eventually gave her another 30 days to look for a place. When I meet Amber at her Meadowview home three months later, it’s a mess. The damaged carpet in the sunroom has been ripped up but not replaced. 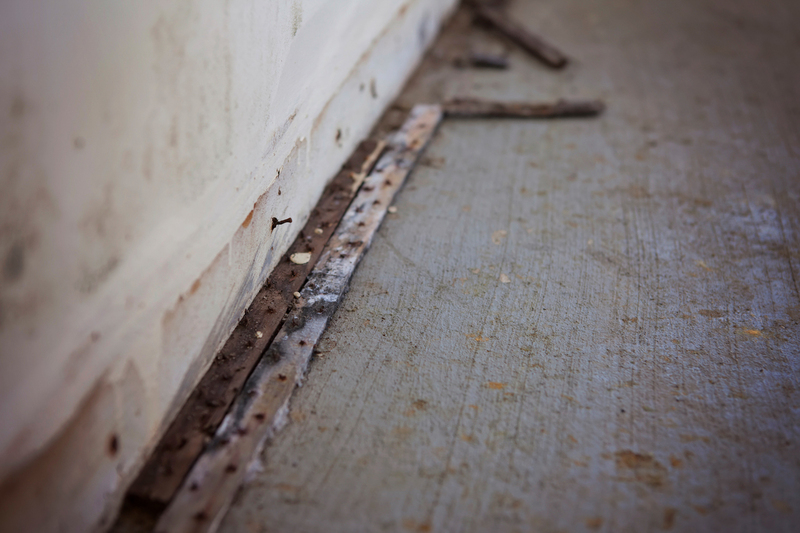 Mold lines the bottom of its walls. Amber is packing up her kitchen as her son’s Chihuahua “Major” barks for a treat. Half-packed moving boxes lay on the floor in every room. Amber says she found a new home, 20 minutes south in Elk Grove. The rent on the other three-bedroom house will be $500 more a month. With utilities, it will eat up almost half her monthly income. “I was blessed for the years I did have here, you know? Because I didn’t know what I had,” says Amber. Sacramento’s projected rental vacancy rate for 2016 is less than 3 percent. The limited supply has led not only to rent increases, but it’s pushed median income renters away from the urban core and further out to the suburbs where rents are typically cheaper. It’s particularly difficult for people such as Amber who make below the region’s median income. She’s forced to pay more for rent no matter where she lives. Amber says the search for something affordable was stressful and exhausting, every day a competition with multiple applicants for the same house. Amber’s son attends a public charter school in Oak Park, which is closer to downtown. He’ll now have to change schools. 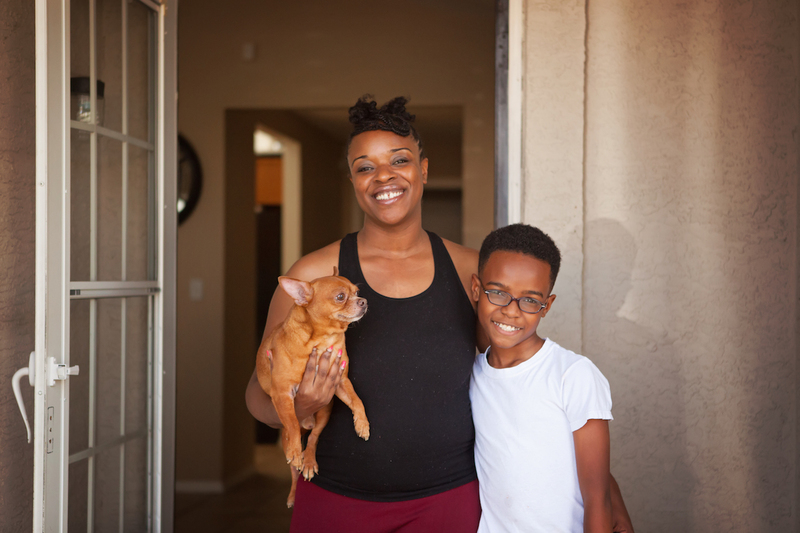 Wanting a better life and a better home, Amber dropped out of high school and enrolled in Sacramento Job Corps, a career training center administered by the U.S. Labor Department. It changed her life. Moving day starts at 7 a.m. Amber rents a truck. Her fiance and his two teenage sons start loading the furniture. Amber says she’s hoping it will take just one trip. But things don’t go as planned. Her stepson locks the keys in the truck. Unlocking it will cost an extra $85. She doesn’t mince words about how she feels. It’s not even noon, and she’s exhausted. The move ends up taking three trips, into the late evening, and she’s scheduled for work at 6 a.m.
Amber gives me a tour of her new home in Elk Grove in March. It looks brand new with a modern kitchen and fresh paint on the walls. But there are still problems. Her gas oven doesn’t work, the backyard fence is collapsing and the grass is knee high, even though the owner promised to have it cut by the time she moved in. After another month of living there, she notices more problems. Bubbles in the paint by the chimney have appeared, and she says water is coming in through the floors. Amber says she’s had to cut back on expenses to afford the increased rent. No more cable. Her family doesn’t go out to dinner. Her fiance sold his truck so their insurance is lower. She says she’s living paycheck to paycheck. She can’t afford her housing. Until she was forced to move from Meadowview, Amber had taken steps to buy her own home. She had contacted a lender, a real estate agent and hired a company to help improve her credit rating. She hasn’t given up hope. The last time I visit Amber is in May. She opens her laptop to show me her engagement photos. She and her fiance are on a beach in San Francisco, the Golden Gate Bridge is in the background. They’ve scheduled a wedding for next June. By then, her Elk Grove lease will be up and they hope to own a home. One they can afford. Gracie Phillips used to own a home. Then the recession hit and she was laid off after more than a decade at AT&T. She started a downward spiral, went through a divorce and spent her retirement savings. Even after going back to school to get a master’s degree, she still couldn’t find a full-time job. “I lost my home. I lived in North Highlands. I had a house that I owned. I repeat, I had a house I owned,” Gracie says. She talks a lot about that house. Unable to make payments, she put it up for a short sale. 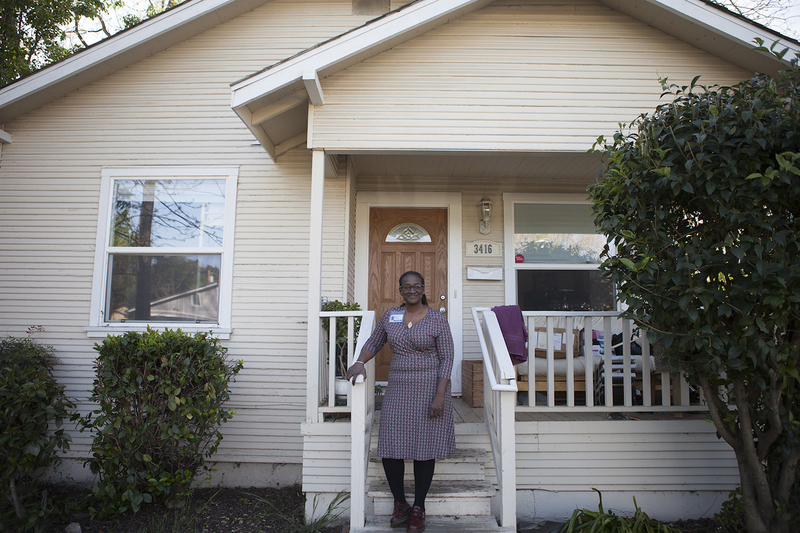 In Sacramento, many African Americans such as Gracie lost their homes during the last recession. U.S. Census figures show that unlike other demographic groups, the black homeownership rate hasn’t bounced back. In 2015, fewer than 30 percent of black Sacramentans owned a home, down from 43 percent in 2006. By comparison, 62 percent of whites owned homes in 2015. The trend is mirrored nationwide, according to a new report by Harvard University’s Joint Center for Housing Studies. It shows a nearly 30 percent gap in homeownership rates between African Americans and whites in 2016. The center says it’s the greatest disparity in its 70 years of data collection. Facing a mountain of student loan debt, Gracie and her teenage son rented a tiny three-bedroom house in Central Oak Park for $1,050 a month. Gracie says the neighborhood was mostly low-income at the time, and the property manager took her word that she would soon have a full-time job. She now works for Sacramento County Child Protective Services and makes just below median income for Sacramento County - $62,800. “The only thing I was really paying attention to was how much it cost and whether I could afford it,” says Gracie. The home had been renovated and had a new kitchen. But it wasn’t. The kitchen was covered in cockroach filth. “They gave me a refrigerator and the refrigerator had frozen roach bodies of all kinds.” The stove was filthy too. It’s illegal to rent a unit to anyone in California with roaches present. The property manager paid for extermination once. But when new roaches showed up, Gracie was told she had to pay for another extermination. The house still has termites. 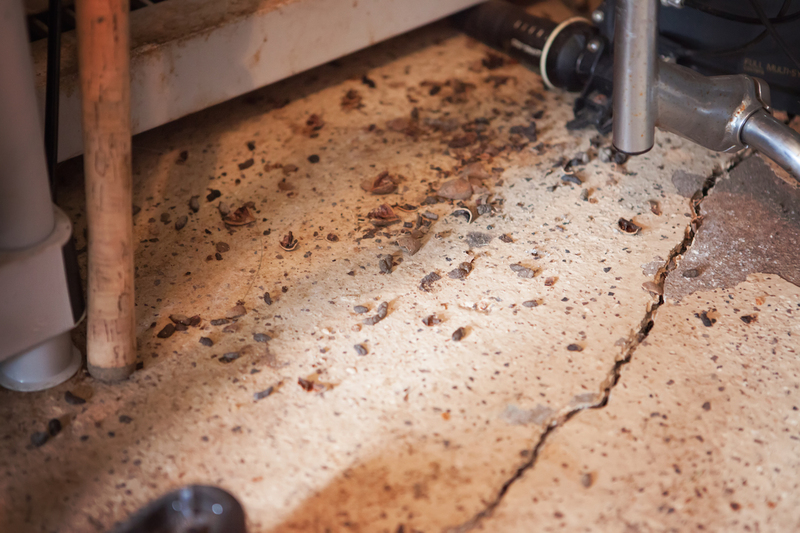 The kitchen linoleum is ripped. Improperly installed windows don’t stay open, and some of the walls sag. Gracie seems unfazed as she takes me on a tour of what’s wrong with her house. “All my doors were busted and you just make do because again, I’m not paying a lot,” she says. 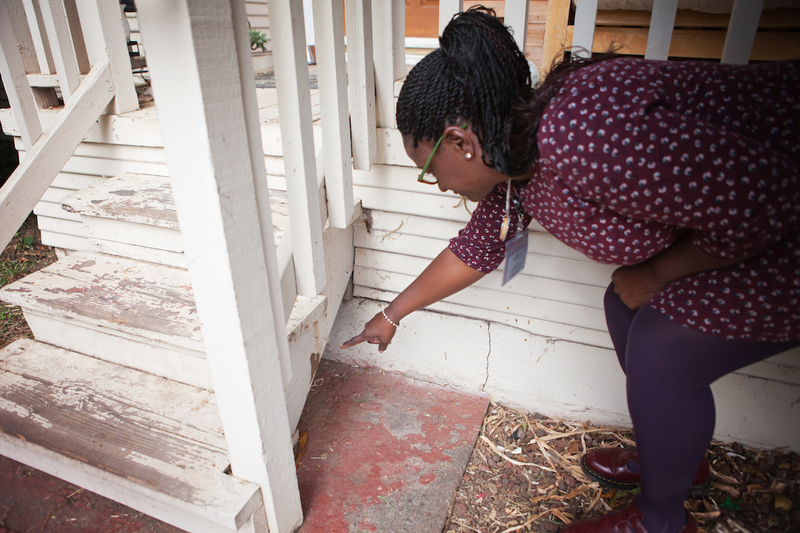 Black dots that look like rat or squirrel feces dot the floor of her detached garage. She’s reported this to her property management company. But she won’t call code enforcement for fear that her rent will increase or she’ll be evicted, even though it’s illegal for a landlord to retaliate. Home-flipping has intensified in Oak Park over the last several years. Gracie says when she moved in, the neighborhood was mostly poor and black. She jokes that the neighborhood had “personality” and “events,” referring to the “ladies of ill repute” who lived next door and the time a SWAT team descended on her street right after she moved in. But Gracie says the neighborhood is changing; it’s gentrifying. Gracie was hit with a $100 rent increase in April. With $75,000 in student loan debt, she says she’s become accustomed to limited funds. But when that first rent increase was automatically deducted from her checking account, she got an overdraft charge. There are things she doesn’t buy. The two cars she owns are older than her teenager. She drives whichever one is most reliable at the time. She can’t drive her Volkswagen in the rain. Her other van smokes. Gracie says she feels scared when she thinks about cutting back expenses. “How do you do that when most of your money goes toward rent and bills?” asks Gracie. She says only two things come to mind, a $15 audiobook subscription and a credit tracking service. Gracie says she could save here and there, unless the car breaks down, or the van needs new tires. This week, the door fell apart on her Volkswagen. It may seem unfathomable that someone would consider living in a car for the opportunity to someday own a home. But Gracie doesn’t consider where she lives now a home. Instead, Gracie thinks about maintenance problems she has no control over. “I walk into my shed and I think about bubonic plague,” she says. Gracie does find refuge in her backyard. She’s got a hammock where she reads. Amid the weeds, she’s made a small garden. Some of her prized possessions from her old home are there too, including paving stones and a woodstove she can’t bear to part with. She still thinks about the home she lost. Gracie would also give anything to own a home. She reached out to Habitat for Humanity before her current employment but needed two children to qualify for a home. Now she’s trying the conventional way, by contacting a home loan consultant. But because of her debt and credit score, Gracie can only buy a home worth $165,000. The median sales price for a home in Sacramento is $330,000. The home can’t be a duplex, condo, manufactured home, foreclosure or short sale. The loan consultant told her to save what she can. Gracie’s home is also hurting her health. The stress of living paycheck to paycheck, makes her depression and fibromyalgia worse. “I’m afraid every day, and when you wake up in the morning and you think about this stuff, this isn’t healthy. This isn’t healthy,” she says. She tells me it might all be better if she could just find a safe place to live that she can call her own, but it all seems out of reach. 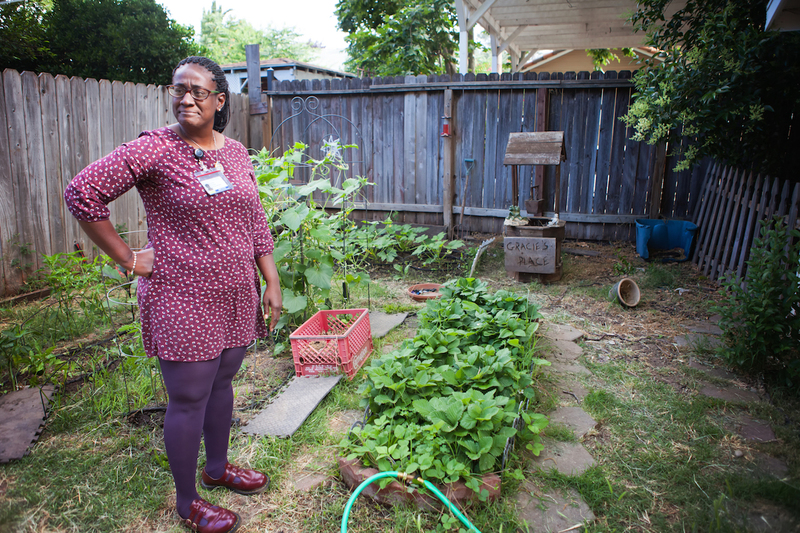 For Gracie, Sacramento’s affordable housing crisis has only hit some in the community. African Americans experience the problem more profoundly, she says. 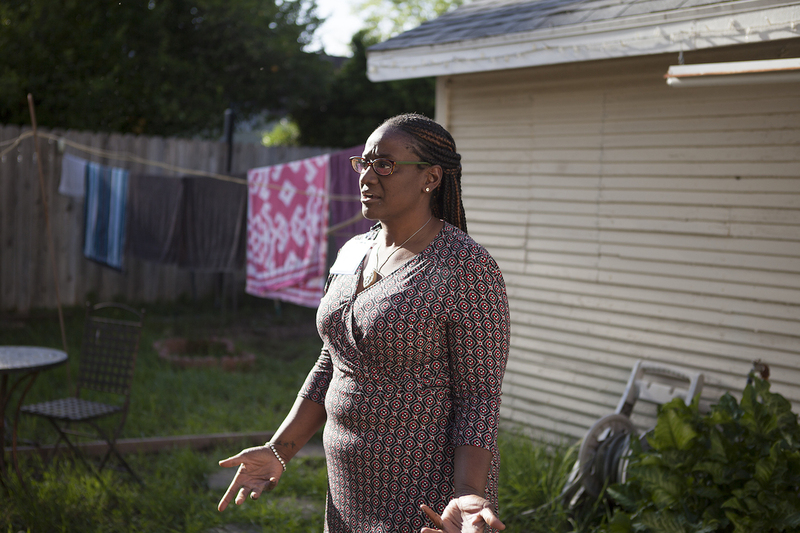 She sees it in her own neighborhood, as she watches homes flip and black renters get displaced. Gracie is living proof that homeownership among blacks still hasn’t bounced back from the recession. 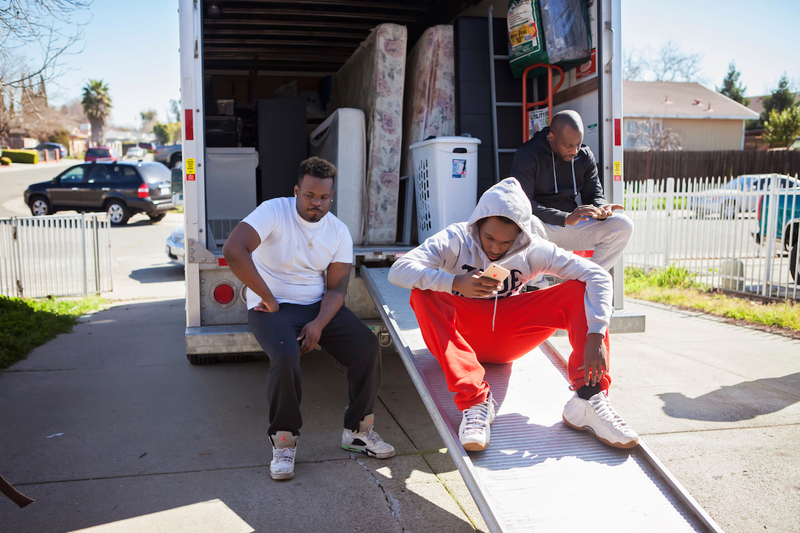 Sacramento’s housing crisis is not just a problem for individuals. There are larger forces contributing to the lack of affordable housing. After the recession, institutional investors in Sacramento bought thousands of single-family homes and turned them into rentals. Advocates say a lot of those purchases were in more modestly priced neighborhoods ideal for first-time buyers, including Meadowview and North Highlands where Amber and Gracie used to live. That’s decreased inventory in an already tight market. The lack of supply is pushing rents higher. And Sacramento’s neighborhoods are changing. The orange dots on this map show rentals owned by two of Sacramento's largest institutional landlords as of January 2017, Invitation Homes, an LP of the private equity giant Blackstone Group, and Starwood Waypoint Homes. In August 2017, Blackstone’s Invitation Homes merged with Waypoint, creating one massive rental home company. The publicly traded real-estate investment trust would own 82,000 homes across the country in 17 metro areas. It’s betting that home-building will continue to lag behind demand, and that restrictive lending practices and lack of personal savings will keep the rental market hot. Housing advocates contend that Blackstone is preventing homeownership by limiting the supply of homes for sale, particularly for first time buyers. Blackstone is investing in markets nationwide where rents are rising, according to the Wall Street Journal. Shades of blue on this map represent the racial makeup of the Sacramento region, according to US Census figures. The darker the blue, the higher the percentage of white residents, the lighter the blue, the more ethnically diverse. The map also shows the percentages of homeowners and renters in each tract. The largest concentrations of rental homes owned by Blackstone are in neighborhoods that have a higher percentage of people of color. Explore more community voices, learn about upcoming events or tell us what you think.